= cukrinis žvyninukas EN · silverfish DE · Silberfischchen PL · rybik cukrowy RU · обыкнове́нная чешу́йница, сахарная чешуйница Subclass: Apterygota Order: Zygentoma Family: Lepismatidae Lepisma saccharina (commonly called the fishmoth, urban silverfish or just the silverfish) is a small, wingless insect typically measuring 12–25 mm. Its common name derives from the animal's silvery blue colour, combined with the fish-like appearance of its movements, while the scientific name indicates the silverfish's diet of carbohydrates such as sugar or starches. It belongs to the basal insect order Thysanura, and the species is estimated to have existed for over 300 million years, originating in the Paleozoic Era. Diet The favorite food of silverfish is any matter that contains starch or polysaccharides, such as dextrin in adhesives. These include glue, book bindings, paper, photos, sugar, hair, and dandruff. 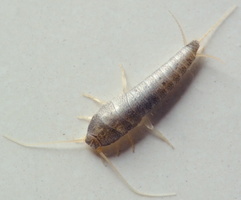 Silverfish can also cause damage to books, tapestries, and textiles. 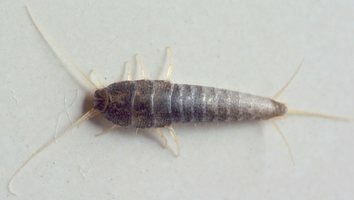 Silverfish will commonly graze in and around showers, baths, and sinks on the cellulose present in many shampoos, shaving foams and so on. Apart from these cases, the damage caused by silverfish is negligible and they have no direct effect on human health beyond psychological distress to those who are frightened or disgusted by their appearance. Other substances that may be eaten include cotton, linen, silk and synthetic fibers, and dead insects or even its own exuvia (moulted exoskeleton). 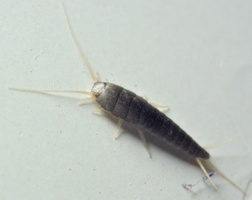 During famine, a silverfish may even attack leatherware and synthetic fabrics. 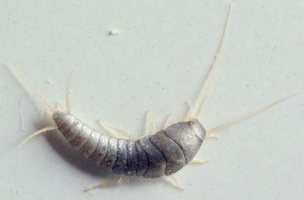 In extreme cases, silverfish may live for a year without eating. 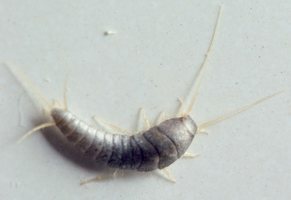 Silverfish can be found anywhere in homes including, but not limited to, garages, closets, underneath beds, couches, electrical appliances such as keyboards and generally preferring dark areas. 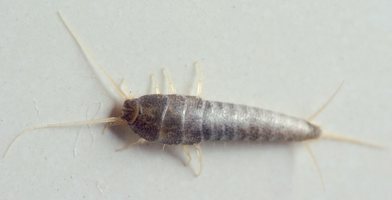 Reproduction and growth The reproduction of silverfish is preceded by a "love dance", involving three phases, which may last over half an hour. In the first phase, the male and female stand face to face, their trembling antennae touching, then repeatedly back off and return to this position. In the second phase the male runs away and the female chases him. In the third phase the male and female stand side by side and head-to-tail, with the male vibrating his tail against the female. Finally the male lays a spermatophore, a sperm capsule covered in gossamer, which the female takes into her body via her ovipositor to fertilize the eggs she will lay later on. 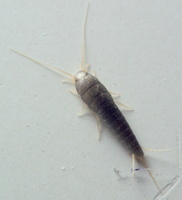 Juvenile silverfish are white in color. 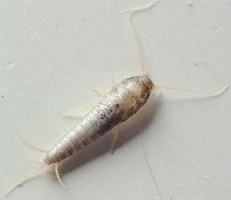 Under laboratory conditions, silverfish may go through between 17 and 66 molts, much more than usual for an insect. 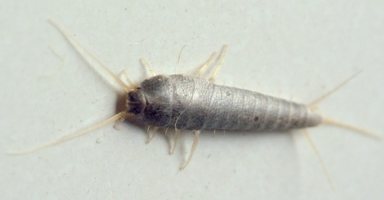 Silverfish are one of the rare insects that continues to molt after mating.